A few words about the history of our cemetery…. 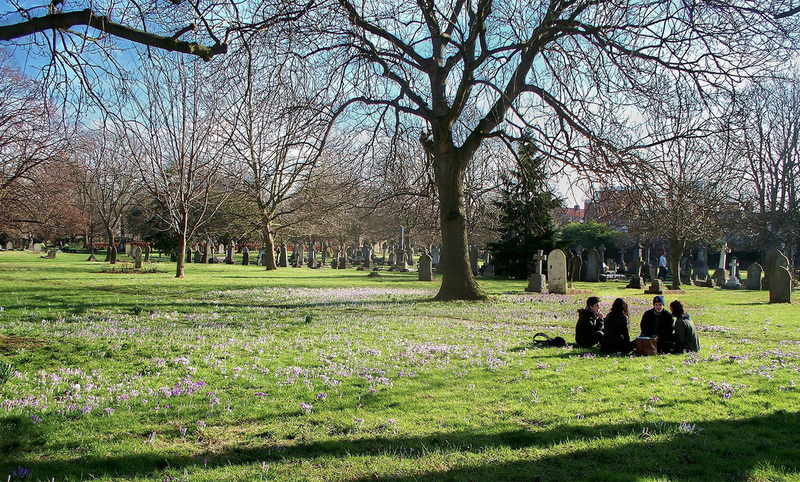 Now a pleasant open space in a heavily built-up area, Margravine Cemetery was declared a Garden of Rest in 1951. After over eighty years of good service to the Borough and a not untroubled history the cemetery probably thought it was due for a rest. Now, almost sixty years later, it rests still. And long may it do so. The need for a cemetery in our Borough was the result of an Act of Parliament passed in the middle of the 19th century banning any further interments in the churchyards of the Metropolis due to overcrowding and unsanitary conditions. This may have been an unwelcome law for many authorities (“where’s the money to come from! ?”) and certainly Hammersmith Vestry didn’t exactly rush into providing a new burial ground. The first thing it did, in fact, was set up a Committee, the Burial Grounds Committee. It took this Committee fifteen years actually to open a Burial Ground. In the meantime interments of residents took place in adjoining parishes. A Good Neighbour Policy of a different sort. After considering and rejecting sites as far apart as Hampton, Tooting and Leatherhead the Committee which in 1863 became the Hammersmith Burial Board found a sudden and overdue sense of urgency when in 1866 there was an outbreak of cholera in the area. In September of that year the Board purchased nearly ten acres of land in Fulham Fields, land that was to become the first Hammersmith or Margravine Cemetery. The land cost £600 (now about £36,660) an acre and the transaction took 18 months to complete. The land purchased had been used as market gardens and orchards and the tenants were told to quit after the next year’s harvest. Uprooted tenants must have been followed by uprooted trees as the cemetery took shape. In 1867 plans for the ground and buildings were submitted and on 25th November 1869 the cemetery, which then comprised 10 acres and reckoned to have space for 12,000 graves, was officially opened. After a fifteen year delay one feels there might have been something of a queue at the gates. And it’s worth remembering that the first cremation in London did not take place until 1885. The cemetery was divided into two unequal parts, the larger part being consecrated for Anglicans, the lesser un-consecrated part for the nonconformists, each with its own chapel of rest. There was something of an anti-establishment fuss about this but when the cemetery was extended to the east and later to the west this seemed to ease the situation; but it created another problem when as part of a land-exchange deal with Sir William Palliser the land-owning knight failed to complete his part of the bargain to provide a wall along the eastern boundary. Legal action was threatened and it was still uncompleted at his death in 1882. The original gates, and the superintendent’s house, were in Margravine Road. Gravediggers were accommodated in the South Lodge by the Field Road gate and the North Lodge by the Margravine Gardens gate which was opened in 1887. The wife of the gravedigger who occupied the North Lodge acted as gate-keeper for this new entrance. If her ghost were to return she would, no doubt, be somewhat taken aback by the attire of some of the people who parade through her gate in this modern day and age. Once bustles and bowlers; now baggy jeans and baseball caps. But this parade also includes the doctors, nurses and other members of staff using the now well-established shortcut between Barons Court station and Charing Cross Hospital. The cemetery was filling steadily and in 1904 the Council purchased 32 acres of land in Lower Richmond Road, Kew, to create a new burial ground. Following in the foot-dragging tradition of the old Hammersmith Vestry and its successors it took the council more than twenty years to open this new Hammersmith Cemetery. Though known and shown on old maps as Hammersmith Cemetery the old cemetery, as the original name of the land tells us, was in Fulham. The new cemetery was in Kew. Hammersmith, it seems, has never had a cemetery within its own boundaries. The new burial ground opened in 1926, relieving the pressure on Margravine Cemetery. By then, after many event-filled years – a superintendent’s drunken foul mouthed wife upsetting visitors and creating “a crowd” on Christmas Day 1879, belligerent gravediggers demanding higher wages and having fist-fights in the tool house, the nonconformists’ objections, the battle with Sir William Palliser, a fair amount of wheeling and dealing when acquiring or exchanging land – a cemetery planned for 12,000 had had to find space for over 83,000 interments. An area used as a pathway was dug up to provide more graves; the residents in Palliser Road were complaining about the stench, and there were other problems so by October of that year the 33 remaining private burial spaces in consecrated land were reserved for the remains of long-standing residents who had rendered outstanding service to the borough while the remains of Hammersmith’s less distinguished departed were sent to find rest at Upper Richmond Road. During the Second World War the cemetery was bombed three times, in September and November of 1940. Official reports were carefully worded but there was mention of a “crater”. This must have been a most unpleasant experience for those living nearby. The 16½ acres of Margravine Cemetery became a Garden of Rest in 1951 when the then Hammersmith Council concerned at its dilapidated appearance decided to remove as many memorials and bury as many tombstones as possible and lay the cleared land to grass; there were many local objections but in general the Council paid heed only to those received from the registered grave owners and left such plots undisturbed, as were those in the care of the Commonwealth War Graves Commission. Some of the more significant memorials also were retained, including the Young family mausoleum, the only one in the cemetery. By 1965 this “clear-up” operation was completed, leaving behind the fascinating mix of grave stones and grass, tombstones, turf and trees that we enjoy today. I am indebted to Anne Wheeldon of the Hammersmith & Fulham Archives and Local History Centre for allowing me to use her excellent and thorough research notes as my main source for this brief history of our cemetery. There has been a long held belief among locals that the Church of England chapel was bombed during the War. The Borough archives show that it was in fact demolished in 1953. Could it be that it was damaged by a bomb in 1940 and after the War the Church decided in the interests of economy to allow for its demolition? Through the website we are now hearing from relatives of people who were buried in the cemetery. We also heard from the great great great grandson of one of the workers in the cemetery, together with photo. We are trying to piece together history of the cemetery through these sort of contacts, so please do add to these if you are able.